Last night I had the privilege of seeing Casting Crowns at First Baptist in Ft. Lauderdale. It was perhaps one of the most encouraging and real presentations of Christ that I have seen. It always seems a bit daunting to share our faith with complete strangers. We worry about how we will will sound, exactly what we will say and how we will be perceived and received. Fact is, none of these really matter because it's never about US! The candid, down to earth dialogue of front man Mark Hall with the audience was so refreshing, heartfelt and effective. I found myself wanting to become more like Christ and completely engaged in His plan for ME! My heart was stirred and my faith was increased throughout the evening. I left with the understanding and hope that nothing is impossible with God. And isn't that what a Christian music event should do? Couple that with the soothing vocals and praises from Lauren Daigle and you have a night that was perfectly crafted to lift up Jesus and help others find Him in their challenging seasons. No matter how bad the storm may be, we have hope, help and healing when we call upon Jesus. 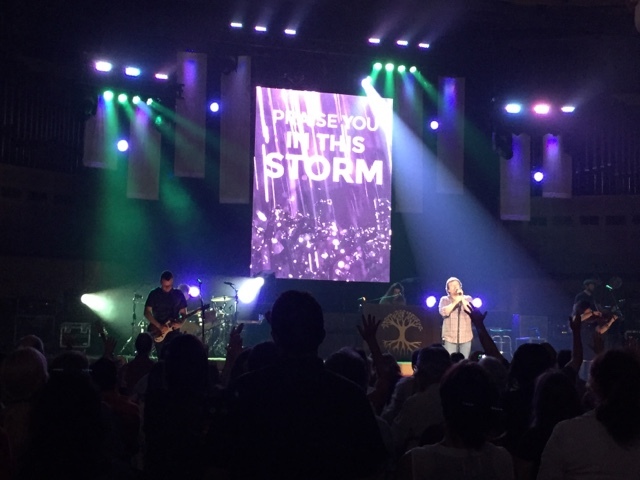 Thank you Lauren and Casting Crowns for a night that truly helped us all learn the art of how to praise Him in the storm.